What once used to be considered a “gimmick” has now turned into a dominant program. Ever since Mike Bellotti transitioned into an up-tempo spread offense team and then handed the reigns to Chip Kelly, the Oregon football program has since been in question. After making a Rose Bowl appearance in 2009 followed by a national championship game appearance in 2010, the question has been, “Is Oregon’s window closing?” Every offseason seems to bring the same questions, and Oregon continues to respond with the same answers. However, the Ducks remain consistent in their streak of seven straight 10-win seasons. Heading into the 2015 season, more questions arise around whether or not the 2015 team can have the same success as the 2014 team. Here are four different reasons why the Oregon football program is arguably in its best state heading into this coming season. In today’s era of college football, recruiting is the lifeline of a program. The necessity to sell a program as a coach to an 18-year-old kid and his parents is a tall task to accomplish, which is why a coach needs to surround himself with supporting coaches that hold the same ideas and approaches as he does. Oregon provides a perfect example of coaches who agree with one another. Veteran coaches on the Oregon coaching staff display the kind of consistency to recruits that promises success. In a time when coaches tend to be driven by better jobs and opportunities, Oregon remains unique. The consistency also allows players to see that the coaches have bought into the “next man up” motto, bringing a family atmosphere to the program. Every off-season, Oregon coaches are often approached for other coaching vacancies, yet they choose to stay. And when the Oregon players use the words “home” and “family” as synonymous with “Ducks,” it pays dividends in recruiting — and especially with moms and dads. 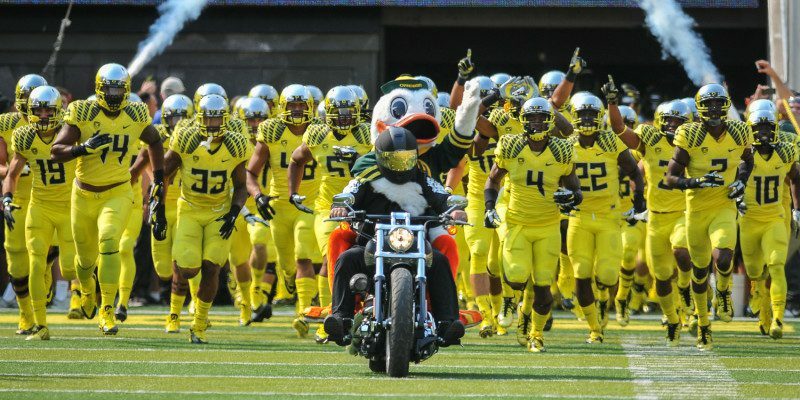 Since 2008, Oregon football has won at least 10 games every year. That means since that this year’s recruits were eight years old, they have seen and witnessed Oregon consistently dominating, playing in bowl games and even appearing in two national championships. Only a few other programs can say they have been as consistent, and what started as a “gimmick” has turned into a contender each and every year. Because of the Ducks’ flashy uniforms, above and beyond facilities and national television presence, the notoriety continues to grow. It’s no wonder that Oregon is adept at plucking highly-rated kids out of SEC country and bringing them to the Northwest. They want to play for the program they grew up watching — and championing — on Saturdays. After three years of Marcus Mariota, the young Hawaiian who managed to make quarterback feats look commonplace, the biggest concern among many is who will replace him. Fans, players and even coaches were spoiled with Mariota’s success. But even if fans look back to each quarterback change, despite the question mark, there has been the same result: winning. 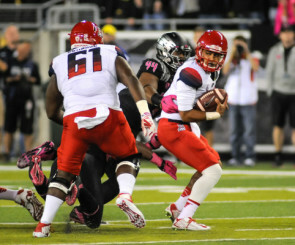 Training quarterbacks intensively is something U of O coaches have down pat. Achieving the title mans making quick and smart decisions, facilitating athletes in space, and occasionally calling numbers and making educated plays. This stems back to Darron Thomas, who was relatively unknown in the beginning, but ended up leading the Ducks to a national title game with about half of the production that Mariota had. 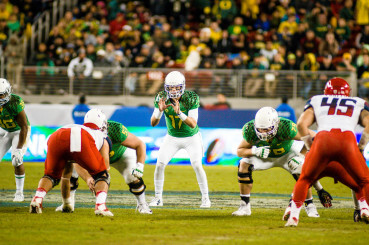 The Oregon offense is a quarterback-friendly system, and this spring’s candidates, with the exception of Travis Jonsen, have had experience for more than a year in it. Going into the 2015 season, experience should factor in Oregon’s favor. All running backs with significant playing time are coming back, as well as all receivers but Keanon Lowe. At first glance, the offensive line may be a concern, but due to injuries last year, younger players have had field time and gained valuable game experience. Even with Heisman-phenomena Mariota departing, there are many trained and viable candidates to lead the Ducks in 2015. And on defense, although some losses were experienced on the defensive line and the secondary, now guys who have been redshirting or taking backup roles will have the chance to compete for starting spots. As Oregon prepares for the challenges and uncertainties of the 2015 season, it is important to realize that the questions most skeptics and fans alike have are the same questions asked in years past. 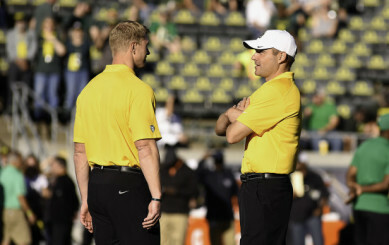 Mark Helfrich and his staff have a proven track record of developing talent and translating that talent into wins. When considering these reasons, we can trust in the system, coaches and plan, because Oregon football is here to stay.